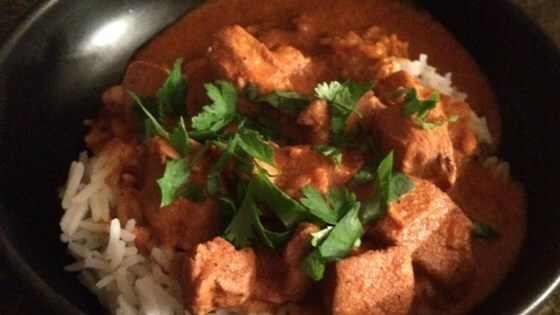 "Indian food is one of my favorites, so when my friend made this slow cooker version for my family we were head over heels! I don't think I've had a Butter Chicken that I've liked more. It's wonderful to put into the slow cooker in the morning and come home to the warm Indian spice smell....LOVE IT! Serve with basmati rice and warm naan bread." Melt the butter and vegetable oil in a large skillet over medium heat. Stir in the chicken, onion, and garlic. Cook and stir until the onion has softened and turned translucent, about 10 minutes. Stir in the curry powder, curry paste, tandoori masala, garam masala, and tomato paste until no lumps of tomato paste remain. Pour into a slow cooker, and stir in the cardamom pods, coconut milk, and yogurt. Season to taste with salt. Cook on High 4 to 6 hours, or on Low 6 to 8 hours until the chicken is tender and the sauce has reduced to your desired consistency. Remove and discard the cardamom pods before serving. Chicken simmers with Indian spices in a creamy coconut milk and yogurt sauce. Take a needle and thread, and pierce the needle through the top of the cardamom pod. Continue with all the cardamom pods and then tie the ends together in a knot so it looks like a ring (you don't have to do this if you don't want the extra step...it just makes it easy to remove and nobody crunches down on a big bitter cardamom pod).